I love a life on-the-go, but I've gotta #keepitreal with y'all and admit that I'm not one of those planner-packers who have it all together. When it comes to my outfit I usually just throw and go and pray for a miracle that I come out looking halfway decent...hell if all else fails I'll wear my white pajama top with jeans and throw on some red lips because duh red lips mean you tried. Over time and lots of traveling I learned my favorite products and must haves for a life on the road. Here are some tried and true go-to travel tips n trick and products because we all know sharing is caring. Ok gotta #keepitreal these are definitely a splurge but SO worth it! So, even when I can't take my pillow I can still have a nice fresh pillow case that smells like home! I order them here. Ok, so this is a GAME changer. Once I started traveling with candles I never looked back. I'll stock up on these and just keep them in my luggage. 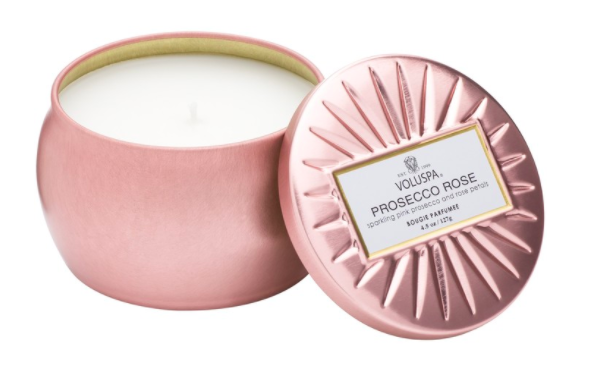 These Voluspa rose gold tins are only $9 and makes such a difference in the ambiance of the room! I love a fedora for super early flight or travel times...hats are such a time and sleep saver and an easy way to look & feel ready, quick:) This one here is from Lulu's and is totally Lady Gaga vibes...get it here!